Rocks, Heights, Lonely Highways, and Armani. LA to San Francisco, CA. November 2-5, 2015. It was time to return Endy2 to his keeper in the city of fog. I rarely like to double back, but fortunately, for those with time it seems there are endless ways to slice the LA-SF run. Notice how the first leg of this is quite short compared to the haul to San Francisco. I guess I discovered that November is not the ideal time to be riding in the mountains, but more on that later. 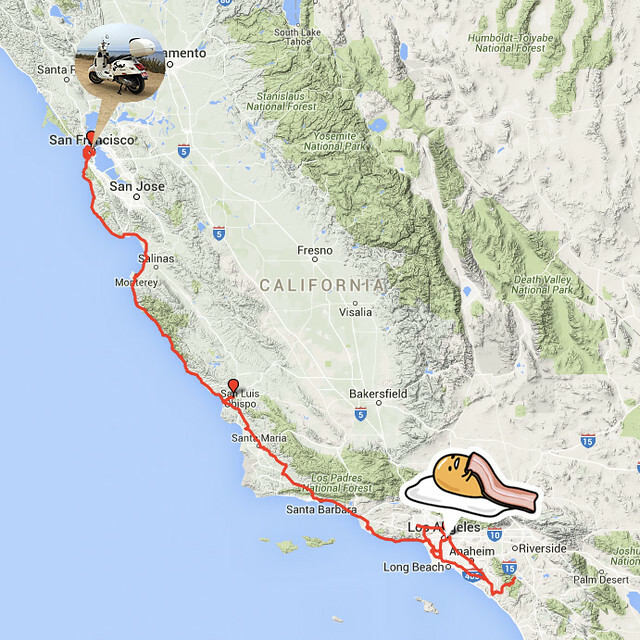 More Lazy Egging, San Francisco to LA. October 13 - November 1, 2015. Another elaborate logistical dance of airplanes, friends, work, and borrowing Pete's bike was about to go down – you know, the regular drill now. By the end of it, I believe I'd be responsible for about 3/4 of the mileage on Endy2. I count myself extraordinarily fortunate to be able to get to know the Pacific Coast Highway so well. All in the name of working for a lazy egg... Or just a great excuse to visit friends in California! Adventures in Philly, Wedding Crashing in Richmond. October 5-12, 2015. I've sliced Connecticut east-west so many times, I already had a clear favorite route in mind: pass by the Scituate Reservoir, route 14 into CT, smaller roads (Machine Shop Hill Rd) aiming for CT-16. Once west of Hartford staying quite far south, I could decide how to proceed. It's my favorite for peaceful wooded roads, but also because friends live right at the intersection in Windham!